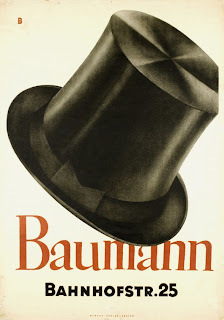 The famous avant-garde hat-Poster by Otto Baumberger is a masterpiece of Swiss poster art. Baumberger, staged as one of the strictest Swiss poster designers, created his first Baumann poster in 1919 with “Bahnhoffstrasse 25” written on the bottom. With the huge success of the poster, the poster was reprinted in 1922 and 1928. This time, replacing “Bahnhoffstrasse 25” with “Fraumuensterstrasse 17”, due to the store’s change of address. 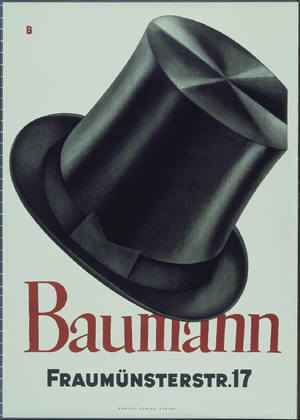 The poster was again printed in 1952, however, the “B” which appeared in the top left hand corner in the earlier printings, was omitted in the later printing. This poster received so much praise that it has been showcased in exhibits around the world. The poster is featured in over 10 poster books including, “The Modern Poster”, “Master of Poster Art – Exhibition Poster Collection” and “History of the Poster”.